People seeking for healthcare in different parts of the world resort to overseas treatment options for good reasons. Relying on private resources makes good reason to shop around for better alternatives elsewhere. While healthcare in the West is notoriously high priced, Thailand medical tourism continues to boom for decades. Dentistry, of course, is no exception. In the field of dentistry, extraordinary prices are evident from commonplace treatment like orthodontics to more complex specialty like implantology. But why Thailand? Dental care is a third of the price in Thailand compared to Western and European countries. Whether you need a new set of teeth or simply want white teeth, it’s all inclusive. All smiles for comprehensive dental care at an affordable price. Save some money for good teeth, and of course, you have lot extra cash to explore the most iconic landmarks in Bangkok, Phuket, and Chiang Mai. They say “you get what you pay for”, but here in Thailand you can expect to “get MORE than what you pay for”. With BFC Dental Center, you can be sure that you are never trading quality for price. Our competent professionals and state-of-the-art technology will not disappoint you. We have been providing world class dental care for both local and international patients for more than 2 decades. Thailand is renowned for its medical tourism. Isn’t it always a plus to get to travel and have your dental work done in the same trip? With BFC Dental, our careful planning will ensure that you do not have to worry about your dental visits while travelling. We can accommodate your travel plans in-between your visits to BFC Dental. 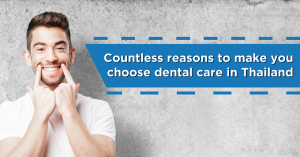 Why not consider dental care in Thailand? Combine your dental care and memorable holiday in a trip.